I hit a local creek the other day - what a great place! I didn't get to explore as much as I'd like to so I'll definitely stop here again. As soon as I stepped in I noticed that the water was cold & clear. It had a gravel bottom with crayfish scooting around. I fished a couple of pools and the breaks until I found a hole that I just knew had to hold fish. With no luck, I switched to a small generic nymph to at least catch some of the bluegills that were chasing my bigger fly. Right after I did that, I had the first smallie hit. I ended up with 3 smallies from one tiny hole, all tucked in behind a rock - nothing big, but still fun! It was well worth the trip and I will definitely go back! I also enjoy (feel good) about the water being clear as your photo shows and with the river (Duper) being very low, one never knows what lurks in the pools. And the depths of these pools can be deceiving. I have gone from above the ankle to above the knee in many a spot which didn't look like much. Keep fly fishing and keep having fun. I think smallmouth fishing with a fly rod is a tad underrated, which is why I usually have my favorite stream all to myself when I fish it. The beauty is the fish don't have to be at all large to be a fun fight on a fly rod. I tend to target 12'-15" fish and even the smaller fish put up a good fight. My go-to flies are foam hoppers in the summer and also wooly buggers. I've heard nymphs can work as well but I don't recall every throwing one at a smallmouth. I have a conundrum (I think that's the word) about the size of the fly. People say to go large for the large fish but on the Duper, if I go large (like a #6), I really don't get too many bites (if any). And a #8 is abot the biggest wooly bugger that I can cast with my 3wt (otherwise, it feels like a brick on the end of the line). If I use a #10, I get smallies but also rockbass and bluegills. I have been thinking of shelving the 3wt in favor of my 5wt glass rod but the 3wt is so much fun and so light and it hangs in the garage so it is grab and go. chuckt, this past weekend I went to sparser/thinned out size 6 buggers (or clouser minnows) for this very reason - easier to cast on my 4wt and sank a bit faster, but weeded out most of the chubs. 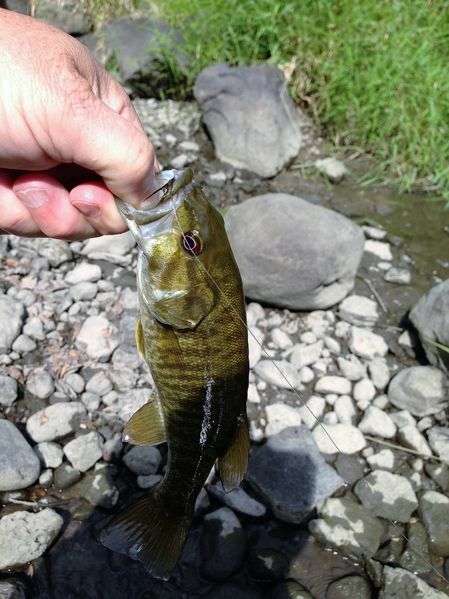 When its hot and august, it is hard to beat pulling smallies out of pockets on a light fly set-up, isn't it? Exactly, Spoonman, I have been opting for wooly buggers that are a little lighter in material. I have been using the autumn buggers from Bass Pro. In the evening, I had been using black poppers earlier in the summer but these have sort of fizzled out lately. I may be out on the Duper, this weekend, depending upon the weather and any chores that may get in the way. I may also pull out my Heddon Black Beauty 5wt and go after carp. I have drawn zeroes with this species but there is always hope. Chitown-Angler was started on February 10, 2003 and has received 207431354 page views in total since that date.